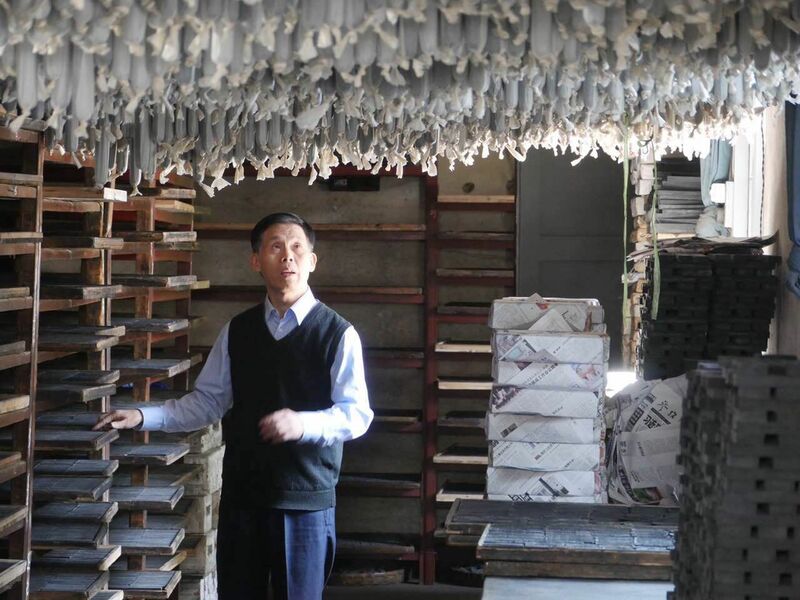 Chinese ink is produced in stick form rather than liquid, so it lasts for generations without drying out. 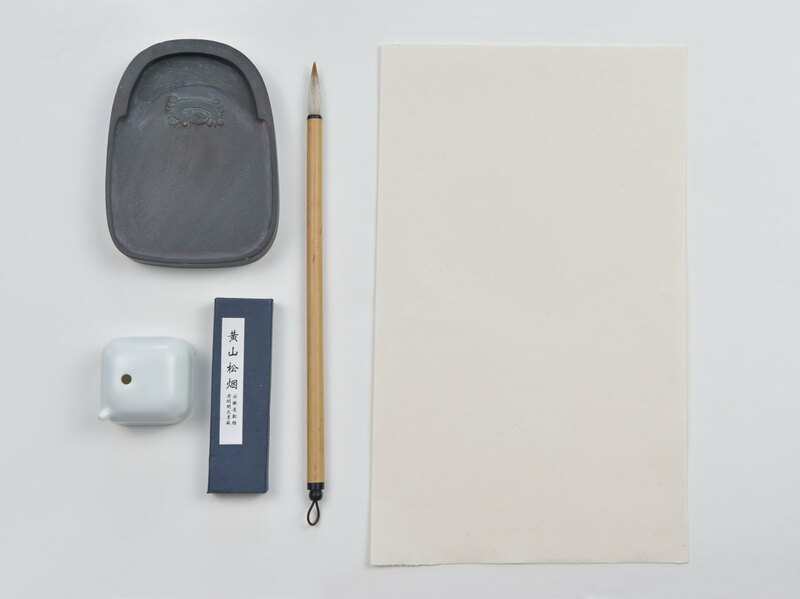 To use the ink, the stick is rubbed on an inkstone and mixed with water as needed. Freshly mixed ink is used with a Chinese brush with a thick body and a fine tip to produce the whole variety of textures seen in Chinese art. Fresh ink is normally preferred to pre-mixed liquid ink since the artist can control the thickness and texture/tone of the ink to produce different effects. “Modern” Chinese ink has been shown from archeology to date back over 2,000 years, to at least 256BC, and of course there’s lots of surviving ancient Chinese calligraphy and art painted with this ink, which survives well unframed and exposed to the air. The resulting inks are regarded as one of China’s Four Treasures of the Study and the most highly regarded is Huīmò (徽墨) which literally means ink from the historical Huizhou region ( 徽州), one half of what is now Anhui province (安徽) which includes Huangshan (Yellow Mountain). 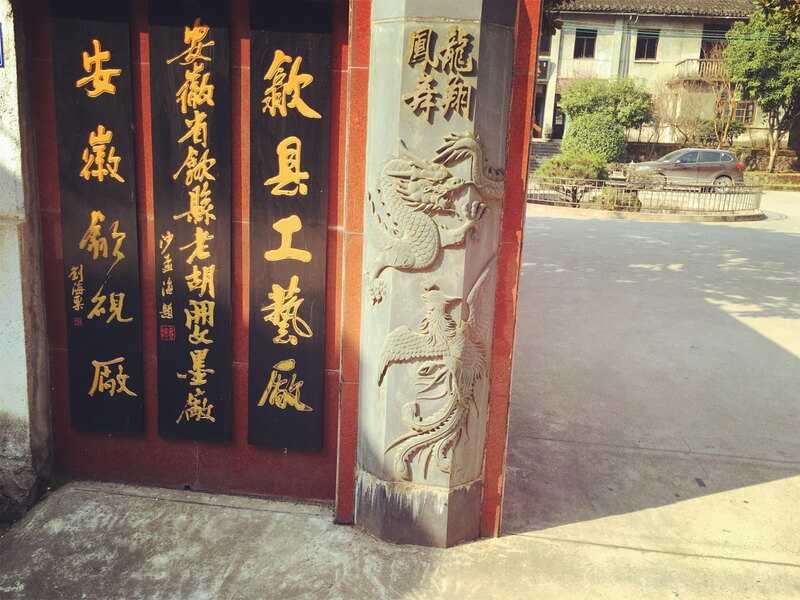 Old Hu Kai Wen, the most celebrated Hui ink workshop, opened in Huizhou in 18th century and supplied special inks for China’s imperial Qing family. In 1915, Hu Kai Wen “Globe” Inkstick won Gold Award in the Panama-Pacific World Exhibition. 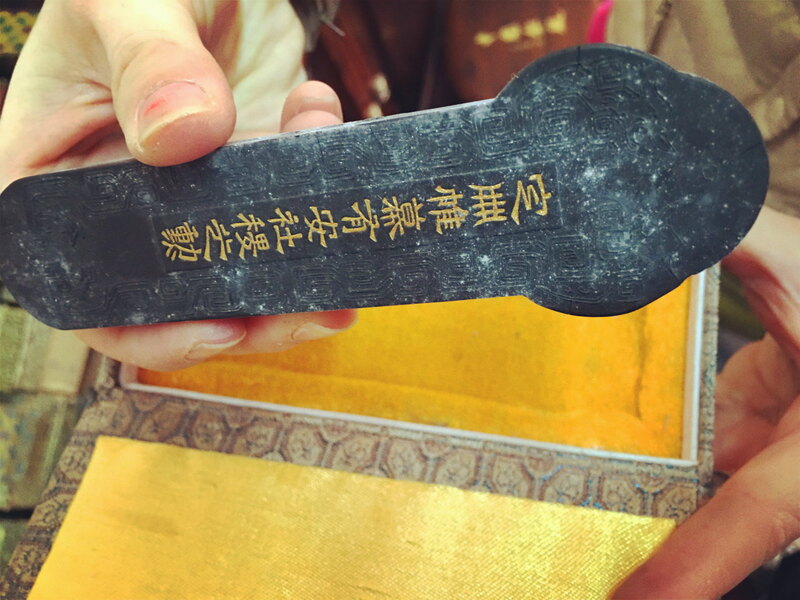 Now after more than 250 years, Hu Kai Wen has become China’s most most famous ink workshop and is accorded China ‘Time Honoured Brand” accreditation in recognition of its continuation of the traditional production. 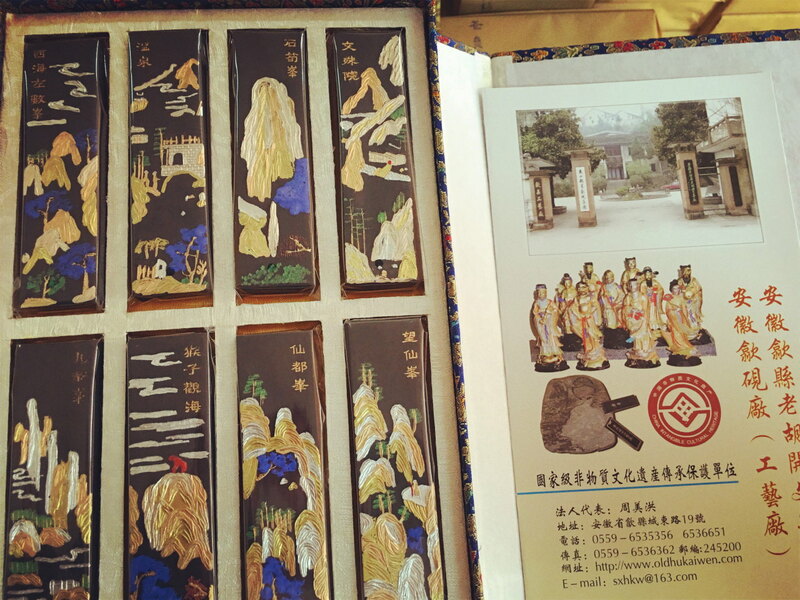 See the Inkstick Buyer’s Guide and Story of Old Hu Kai Wen 胡开文 and Li Ting Gui 李廷珪 Inksticks. 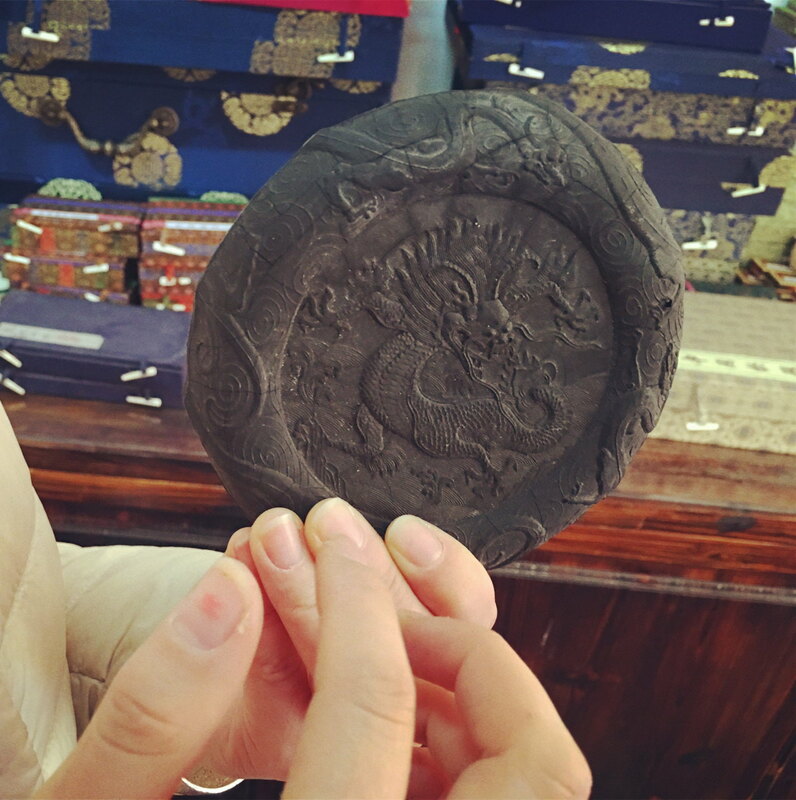 Yan’s blog has some dramatic pictures of how the Hu Kai Wen ink is made and our shop has over 80 varieties of Hu Kai Wen inks. the ink is like paint. very small drop of ink can create very deep colour. the colour can last for thousands of years. 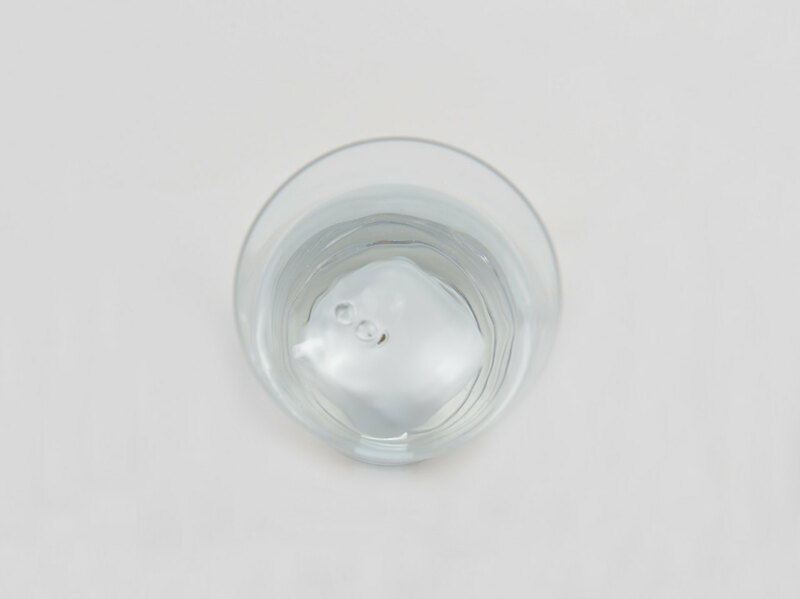 According Li Ting Gui recipe the ingredients should ground ‘100,000’ times so the particles of ink are very fine and easily rubbed on the inkstick and mixed with water. The fine grinding of the inkstick ingredients ensured that it can be rubbed and mixed smoothly and easily to create a smooth thick ink. Since the resulting inkstick can be up to 99% carbon, it can be kept for a long time and does not fade even after use. 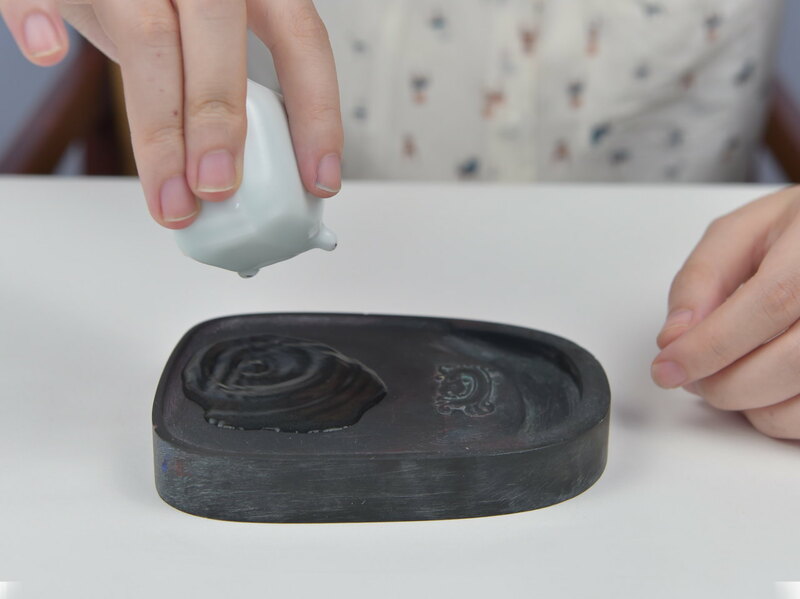 Rub the inkstick with a small amount of clean water to make thick fresh ink, ideally using an inkstone, moisten a brush with clean water and then dip in the ink. Oil soot inkstick is commonly recommended for painting purposes while the pine soot inkstick is often preferred for calligraphy. 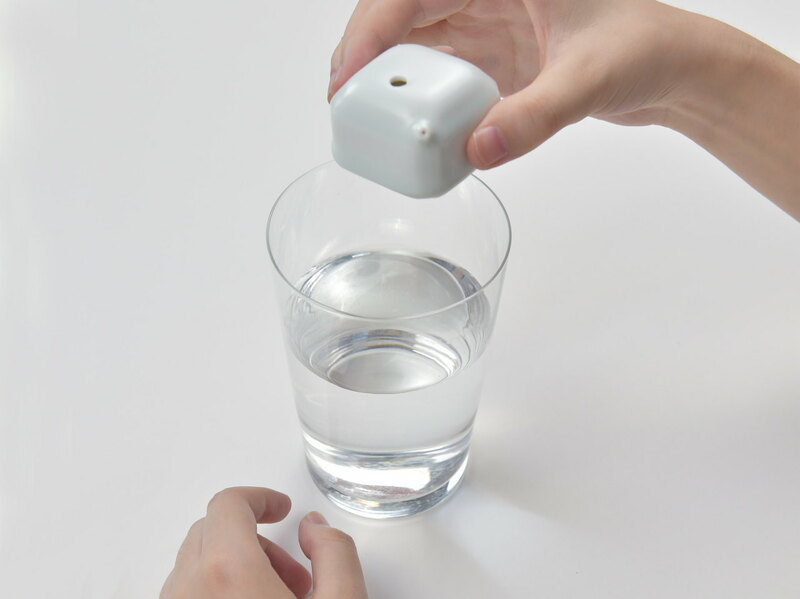 Don’t soak the inkstick or use hot water or other liquids, just a little fresh water. The main components of inksticks are resin and soot, which kept normally can last a very long time (hundreds of years). keep dry – if the inkstick is kept in moist conditions it could encourage fungi to grow and attack the resin. The best care is simply to simply put the inkstick back in its box after use which will keep it safe from sudden temperature/humidity changes and atmospheric pollutants: most of the high end inksticks come in a wooden box which is considered idea for storage. If an inkstick does crack, it can be fixed by using normal glue or thick ink. Chinese black ink is carbon based, and could be known in English as Lamp-black. 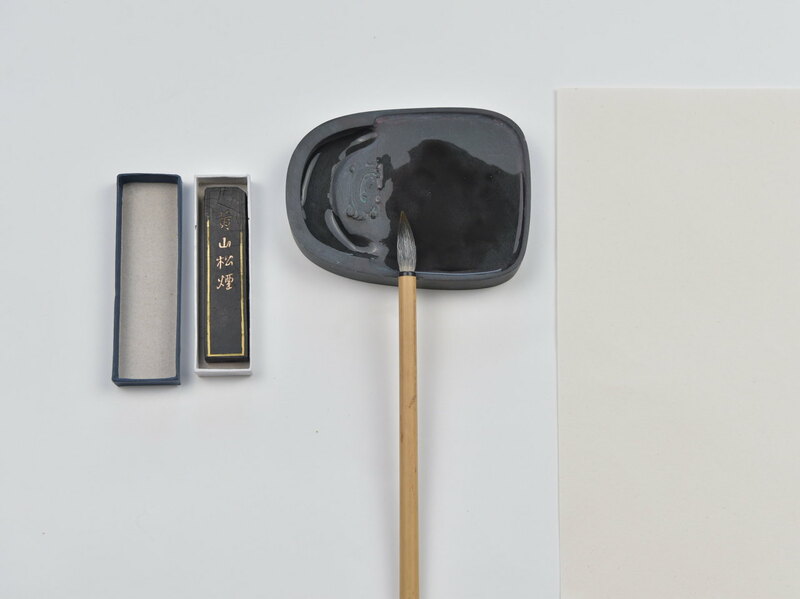 Black ink is used not only for calligraphy but also for Chinese brush-stroke or Ink-wash painting (水墨 shuimo, also known as sumi-e / suibokuga, sumukhwa, tranh thủy mặc). Traditional black Ink stick colour comes from soot from charred pine tree roots, specifically Pinus Massoniana 马尾松 in the Yellow Mountain area. Ink made this way has very rich natural matt dark colour. See the History of Inkstick recipes and the Buyer’s Guide for more information on the different types and for colours see the Chinese Colours article. 日出江花红胜火，春来江水绿如蓝。 – 白居易 "Sunrise red flowers on the river, spring time blue-green water" - Bai Juyi, Tang Dynasty Sets of natural mineral colours and individual sticks of precious colours such as Cinnabar. See Chinese Colours for details of traditional colour ink recipes. 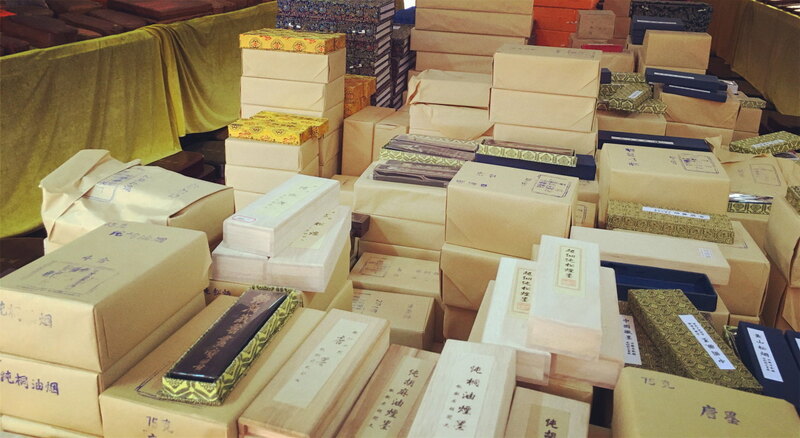 Inkston supplies fine Li Ting Gui inksticks from Old Hu Kai Wen workshop. The inks they have are really AMAZING! High quality!